I was recently at a Transportation Research Board subcommittee meeting where we were discussing accuracy and precision (no one used the word “resolution”). After listening for a bit, I realized a sense of Deja vu. It was a TRB meeting several years ago that inspired me to write an article for my column in LIDAR News (“Random Points”) on this subject. I am repeating the essence of that article here since there is a follow-on discussion that requires this foundation. There is a lot of argument out in the data acquisition community surrounding these topics. It nearly always comes up in arguments about why a particular vendor’s aerial data is better than that stuff on Google Earth®. There is also the old saw – “bad data is better than no data.” Of course, depending on your use, you better be able to quantify how bad and in what ways. It’s no wonder that a lot of confusion exists over quantifying accuracy. Every time I have been in a room full of experts, we argue about the specific meaning of the terms. Since I have the floor here for the moment, we’ll go with my descriptions! A caveat however – this article is meant to provide a bit of insight. It is not a vetted technical article and thus you should use my descriptions and analogies with a lot of caution. We will specifically look at geopositional accuracy as opposed to other accuracy issues such as attributes (i.e. is the ‘color’ attribute correct?). For a more detailed look at geopositional measurement, I think the Washington State DOT “Highway Surveying Manual” is an excellent read (easily found on the web). On the other hand, I find the FGDC standards very dry and light on explanation. There is no other way to do this than to just jump in so here we go! Precision is a measure of the repeatability of a measurement under identical environmental circumstances (meaning, for example, that if you made repeated length measurements with a steel tape over a number of days where the temperature varied, you would violate the ‘identical environmental conditions’ restriction). It always speaks to repeating the same measurement multiple times. Since in LIDAR and imaging work, we very seldom do repeated measurements, this is perhaps the most misrepresented term in our work. Here is a simple experiment that illustrates precision. Take a tape measure and measure the height of a door. Now, using the exact same measurement spot, tape and technique, repeat this 9 more times. Write down your readings to the highest level of resolution supported by your tape (remember resolution?). The range of your readings gives you a measure of the precision, not only of your device (the tape) but your system (where you place your eye each time, how close you are at measuring the same spot, how hard you pull on the tape and so on). The assumption here is that you are measuring some constant object so that variation is solely due to you and your device, not the object being measured. In reality, this may or may not be the case! Now those of you who have studied basic statistics know that if you repeat these measurements enough times (say 30), a plot of the results will produce the ubiquitous Normal (Gaussian, bell, etc.) curve. Precision is statistically quantified as variance (or standard deviation). Now notice that a tape made of steel and a tape, with identical ticks, made of rubber, will have the same resolution but radically different precision. I hope that you notice that we still have not touched on accuracy. For example, suppose we did our experiment of making 30 repeated measurements of the height of a specific spot on a door with an uncalibrated (more on this later) tape having a resolution of 0.001 meters. Suppose we came up with an average measurement value of 2.000 m, a largest reading of 2.002 m and a smallest reading of 1.097 m (for you statisticians, let’s say we have a standard deviation of 1.8 mm). What can we say at this point? Well, the resolution of our tape is simply a given (we will ignore fudging resolution by linear interpolation). Our measurement precision is quite “good” with a maximum deviation of only 3 times the resolution of our tape. However, we cannot say anything at all about accuracy! Here’s the problem. I can just go in to my workshop and whack off a piece of electrician’s steel fish tape. I can mark it with measurements (OK, this would be pretty tedious, I agree!) by just eyeballing. and voilà, I have a steel tape! It would be quite precise if I did not subject it to temperature variations during my sequence of 30 measurements. However, it would, no doubt, be quite inaccurate when compared to a known length. And this is key – you cannot make a judgment about accuracy without having a ‘standard’ to which you are making comparisons. 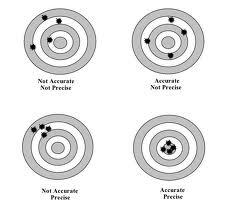 In geopositional work, we are concerned with two types of accuracy. Network Accuracy (which I usually call absolute accuracy but this is a really loose term) talks about how closely your measurements match a known external reference system (what we call a ‘datum’). Local Accuracy (also often called relative accuracy) deals with the accuracy of the measurement of metric units with respect to a standard. By this we mean if you measure a length or an area, how ‘close’ are you to the true value? Note that you can very accurately measure the distance between two fixed points yet be clueless as to the location of the points relative to some outside reference system (again, the ‘datum’). This is the case with our measurement of the door. If I calibrated my tape by comparing to a ‘standard’ meter, I could then use it to very accurately and precisely (the precision coming from my construction of the tape as verified in my repeated measurements experiment) measure the height of the door. Yet I still would have no idea of where in the ‘world’ the two end points of my measurements were located. This is an example of very good relative (local) accuracy yet very poor network (absolute) accuracy. So finally we are left with the term, density. This parameter is not related to accuracy, precision or resolution. In LIDAR work, it would be the number of points per unit area. In imagery work, it would be the number of pixels per unit area. Note that this is often called ‘resolution.’ In imagery work, if using an array sensor, it may be roughly synonymous with resolution. When using scanning LIDAR systems, it is seldom synonymous with resolution. Am I splitting hairs here? No, not at all. If you followed the above discussion, you will realize that precision is based on a quantum number and the size of the quanta is the resolution, not the density (or point spacing). In looking back over this paragraph, I have confused even myself! Basically what I am saying is that it is entirely possible to limit the scanning density of a LIDAR system to roughly 1 point per meter yet have an available horizontal resolution of a few centimeters. Figure 1 provides a nice physical representation of these terms. Note that resolution would be the width of the target rings. Here we are imagining that the bulls eye represents a known location in our datum (maybe we placed some rings around a National Geodetic Survey monument and are taking pot shots with the old Winchester!). A figure that I lifted directly from Wikipedia (Figure 2) provides a more statistical view of accuracy versus precision. Note here that the distance of the mean (average) of the repeated measurements speaks to the accuracy whereas the ‘spread’ of the measurements (variance) speaks to the precision. With this foundation in terminology, we will address how these factors play in to LIDAR and other point cloud data – stay tuned.